Aerite™ Cyclonic Decelerators offer an efficient means of remotely loading multiple farm site feed hoppers or feed broadcaster units eliminating the need for manual labour to hand load feed bags along with the associated problem broken pellets and feed fines creation. Aerite™ Cyclonic Decelerators are sized to address a range of feed delivery pipe diameters, feed delivery volumes, and physical hopper design characteristics. Aerite™ cyclonics are used at the outlet of air/feed delivery pipe systems to separate feed pellets from the fast moving feed delivery airflow. By design cyclonics direct low pressure, high volume air upwards and out the top of the cyclonic while the air transported feed pellets remain within the cyclonic to spin around inside and gently gravity fall down the cyclonic cone’s inside face and out the bottom into the hopper below. Cyclonic Decelerators are often used as an integral part of our MiniMax™ feed delivery systems where a positive displacement blower and rotary valve feed dispenser system is used to send metered feed down long lengths of feed delivery pipes to specific locations. Typically this fast moving air feed pellet mixture exits the delivery pipe and into a mechanical feed spreader such as our Aerite™ Feed Spinner for even distribution across the surface of the cage or pen. However, there are many applications where loading feed storage hoppers or individual feed broadcast hoppers at the end of a feed distribution pipe network is required. In these applications there is a need to separate the fast moving feed delivery air flow from the feed pellets for a faster hands free and less labour intensive means of loading multiple feed broadcasters. The use of Aerite™ Cyclonic Decelerators changes a centralized feeding system that rations time and feed delivery amounts in order to address feeding each pen, cage or pond within its’ multiple outlet feed delivery pipe network. Reconfiguring the farm site to position a feed broadcaster with an Aerite™ Cyclonic Decelerator and receiving hopper at the end of each delivery pipe outlet turns a centralized feeding system into a feed broadcast hopper preload system. This means a normally restricted centralized feeding system can be repurposed to load feed broadcast hoppers at any time of day or night leaving farm operators free to schedule simultaneous feeding from multiple feed broadcasters as required to feed to best FCR (Feed Conversion Ratio) practices. Both steel and aluminum with stainless steel liner versions are available to address farm site environment requirements. 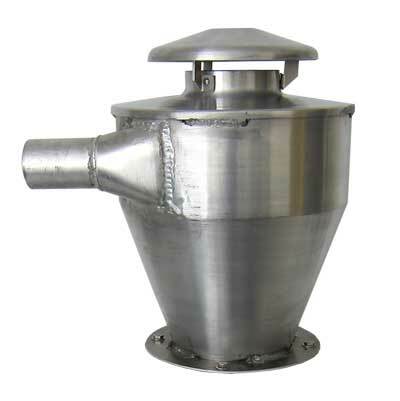 Many sizes available to match with a broad range of feed hopper and feeder designs. May be ordered with integrated hopper lid assembly. Reduce feed hopper loading times. Careful design maximises feed transfer, eliminates feed breakage, and minimises feed dust creation. 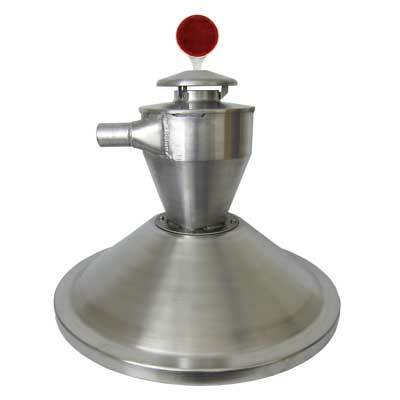 Highly visible, air powered feed load level indicator signals operator when hopper is full. Repurpose a centralized feed system to distribute feed through a pipe network fitted with Aerite™ Cyclonic Decelerator to automatically load strategically positioned hoppers or feed broadcasters. Eliminate the problem of feed distribution times and ration/proportion feeding found with centralized feed systems. Preload feed broadcasters at night and schedule feed broadcasters to spread feed when fish best ready to ready to eat.